I’m really sad that we don’t have a photo of these, because they looked amazing. I wanted to make them last Christmas as a gift, but never got around to it. This year I knew we had a few spare days between finishing work and seeing people for Christmas, so I made sure they got made – and them gave them away as a gift. Not before I’d made sure I’d tried one though! These bonbons are basically little truffles made from (mostly) Christmas pudding and chocolate, which you then decorate to make look like miniature Christmas Puddings. You do this by melting some white chocolate over the truffle, then adding green and red glace cherries to get a holly and berry effect. Now, I don’t care what my myriad of recipe books say (this isn’t the first time I’ve tried to get hold of them), but green glace cherries do not exist in most major supermarkets. Perhaps they do in specialist cook shops, but I’m yet to find any. So, to get the holly leaf effect I cut up tiny strips of marzipan which I then coloured green. Green royal icing probably would have worked here too, or green jelly sweets (which you can usually find, but for some reason had gone on a hiatus for Christmas 2013). The truffles tasted OK, but to be honest they were mostly like very rich Christmas Pudding with some chocolate added. Which is exactly what they were. 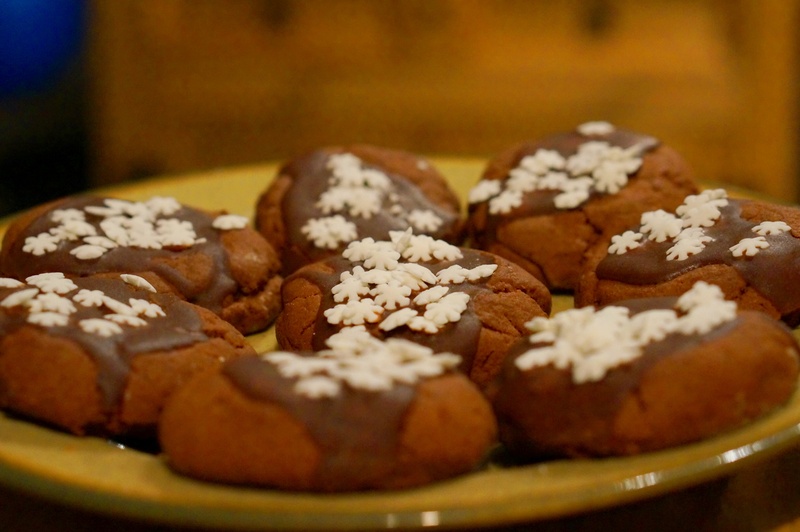 I was mostly proud of these because of the way they looked – which is why I’m sad there’s no photo! The title of this chocolate pudding is Nigella’s title for it, not mine. I love Christmas Pudding, but didn’t fancy making any this year – and also knew I was going to get plenty of it in a week’s time. So this was really Chocolate Pudding for Lazy Bakers who Knew They Were Going to Eat Too Much Christmas Pudding Soon. .. but this tastes amazing. OK, so it didn’t look great (no photo, but I’m guessing you’ll take my word for it), but it tasted so good we ate the entire thing in one day. Between two of us. We got so fat. There’s nothing in this that isn’t horribly unhealthy for you (except perhaps for the natural yoghurt). Which is probably why it tasted so good. PS You have to make the chocolate sauce for this to work. The pudding’s nice, but without the sauce you just won’t get that amazing chocolate high. Or fat enough. In ord er to get Dan to agree to the effort of cooking our own roast dinner on our Christmas Day, I sneakily suggested that we have a vegetarian roast dinner rather than a meat one. Turns out it wasn’t that sneaky, because I didn’t get to eat any meat. Ah well, I got plenty a week later. 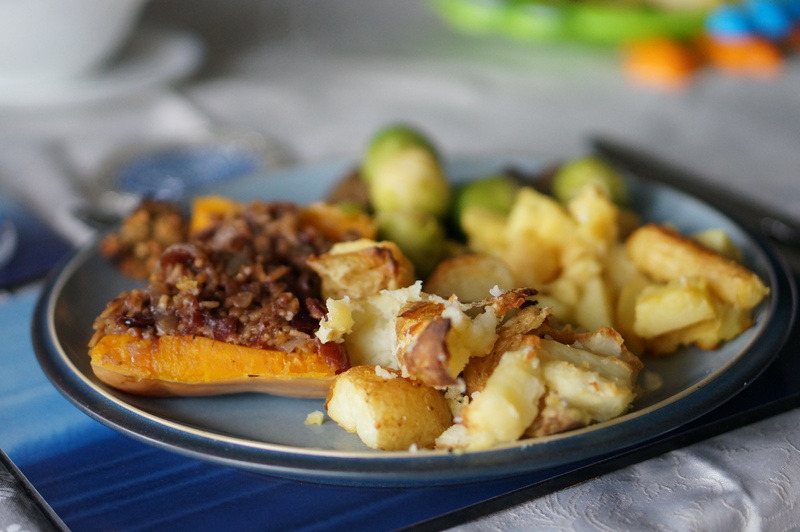 Our vegetarian Christmas dinner consisted of three recipes from Nigella’s Christmas – roast stuffed pumpkin, gingery tomato sauce, and Christmas sprouts. We supplemented this with our roast potatoes and parsnips, which we know taste good because we cook them lots! We couldn’t get hold of a pumpkin, so we substituted this for a butternut squash. This actually worked quite well – once we’d figured out how to make the squash hold the rice mixture and stand up in the oven (it involved a fair bit of tin foil…). The butternut squash and the gingery tomato sauce worked really well together, and the sauce was really easy to make – it’s mostly ginger and passata. Unfortunately, it didn’t go so well with the rest of our roast dinner, which was a lot more traditional. In fairness to the recipe book, it suggests that the stuffed pumpkin and sauce should be served with red cabbage and a salad, which would probably work much better. That’s not a Christmas dinner now though, is it? I do love the taste of brussel sprouts with chestnuts and nutmeg though, and have done it before. I personally think it’s much tastier than simple old brussel sprouts. I did go a little overboard with the chestnuts here though, so the brussel sprouts got a bit drowned. So, whilst I enjoyed both making and eating the stuffed butternut squash, I wouldn’t choose to make it for a main Christmas dinner again. I think a nut roast works much better, and if you make it yourself they can actually taste pretty good. Still not meat though, is it? This is the second year in a row I’ve made this recipe, because it’s much tastier than just eating unspiced nuts. It’s also the second year we’ve entirely failed to take a photo of them, so you’ll just have to imagine what they look like. Basically it’s a selection of nuts, covered in spices. Funny that. All you do is dry fry some mixed nuts (or whatever nuts take your fancy) in garam masala (a brilliant easy blend of spices, which I love now I’ve discovered it), celery salt (don’t use too much), oil and brown sugar. It’s simple, and it’s tasty. I suspect this is going to be a permanent addition to my Christmas menu. It’s also a great snack for the morning when you have to wait ages for your Christmas roast, and you don’t want to start on the chocolate. 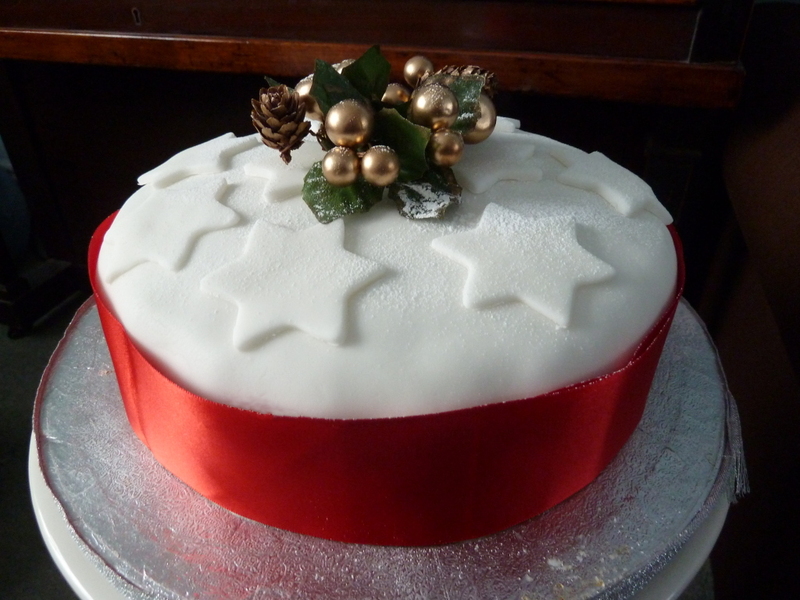 And here’s another Christmas-themed bake. 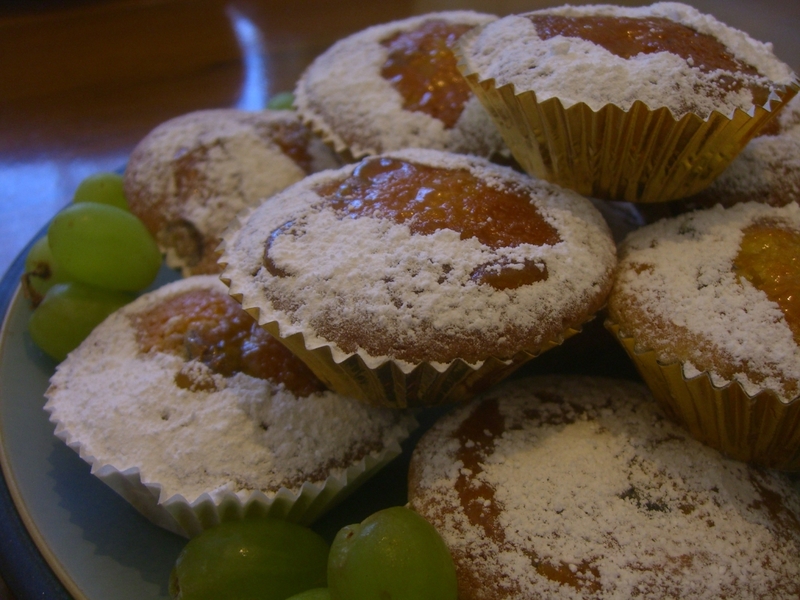 These muffins (no photo I’m afraid – something was always going to get overlooked) were made as something to eat for breakfast on our Christmas Day at home, as the recipe books suggests. I say ‘our’ Christmas Day, because it wasn’t actually Christmas Day. We celebrated at home five days early, because we were going back to see family for Christmas itself. But our son had so many gifts we figured it was easier not to take them all away and then bring them back home again. So these Christmas Morning Muffins are the first of our Christmas Day recipes. Hubby was skeptical that muffins for breakfast was a good idea, as they are usually quite heavy. 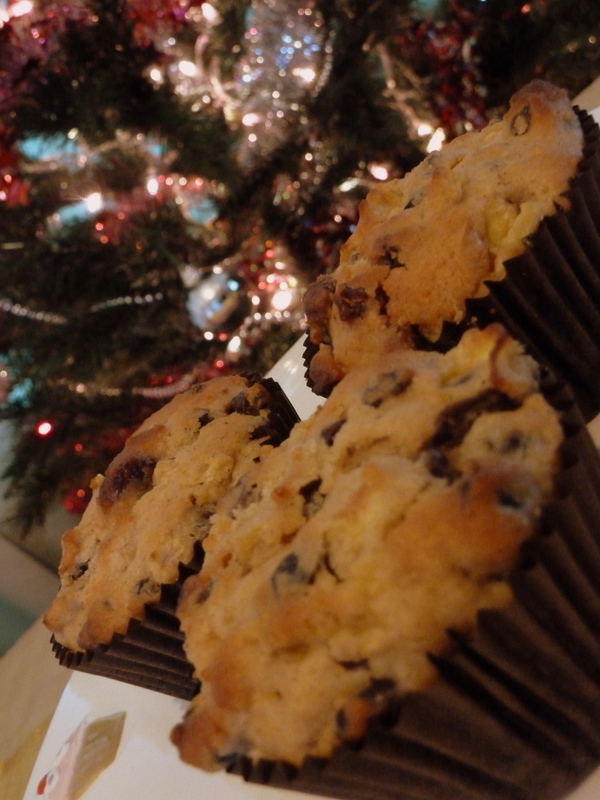 But these muffins are actually much lighter than normal, and worked really well as a Christmas morning breakfast. They were certainly much lighter than the toast we would otherwise have eaten. I suspect the reason for this is that the only fruit in these muffins is dried cranberries and a clementine – everything else is spices and normal baking ingredients (sugar, an egg etc). It seemed to work though, and they were certainly tasty enough to be made again. And so, onto the second of my Christmas-themed bakes. I’ve made a variety of different swiss rolls, chocolate logs and roulades in the past, and really enjoy making them. Some come out well, some go wrong, and some come out amazingly. Obviously, I’m pretty proud of the ones that come out best. I wasn’t expecting this one to come out particularly well, especially after I’d baked the roulade and it looked a bit, well, flat. I have a tendency to mess this up – one of my favourite recipes incorporates a small amount of flour, making it much easier to get right. Of course, this is cheating and not a ‘proper’ roulade, but it guarantees (at least for me) a better result. Nigella’s recipe, however, is a proper roulade – no flour, billions (well, 6) eggs, 150g caster sugar and 50g cocoa powder. … That was until I tasted this. Yes, it is very rich and very chocolately. But it tastes so good. And with a sprinkling of icing sugar to make the snow effect, looks pretty good too. 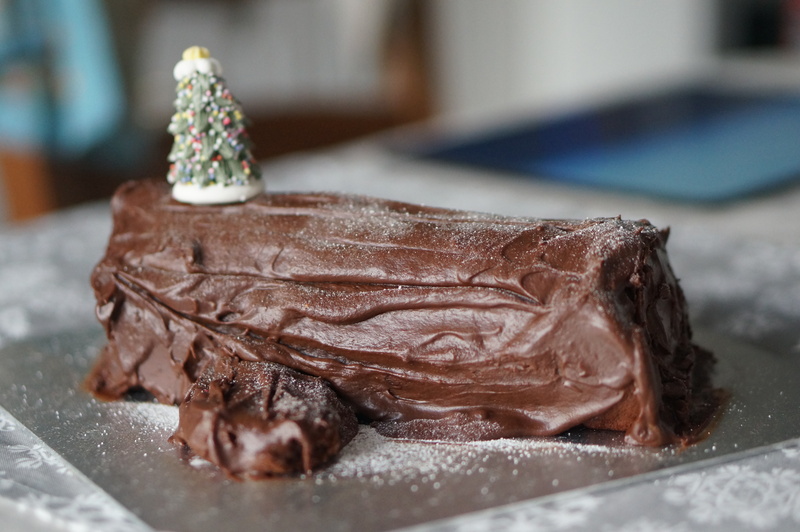 It’s not the only Yule Log I will ever make (I still love the other varieties I make), but it’s definitely being added to my list of all-time favourites. Biscuits for Christmas. You can tell by the little snowflakes on top. We were initially not that impressed by these biscuits – they are very bitter, and have a strange crumbly texture that when they were still hot from the oven we weren’t keen on. We had an abrupt change of heart the next day, when they seemed really rather pleasant and rich and melt slightly in your mouth like a chocolate brownie with an identity crisis. So overall these are certainly worth a try if you like your chocolate bitter. They are really rather simple, too. To make 24, you’ll need 250g butter, 150g caster sugar, 40g cocoa powder, 300g plain flour, 1/2 teaspoon bicarb of soda and 1 teaspoon baking powder. You can basically just mix the whole lot together and bake at 170 degrees celsius for 15 minutes (for a batch of 12). It is that easy. The topping is basically just melted chocolate. To make it, take some chocolate, and melt it. Pour it on the biscuits, then use your finger to clean the bowl. Recipe: Nigella Christmas, page 207. Otherwise known as Christmas Muffins, these guys are the result of a mad scientist’s experiment breeding mince pies with cute fluffy innocent muffins, and the result is tasty indeed. Looking at the ingredients, there is a lot to be worried about here. Alongside innocent things like cranberries, raisins, mixed spice and brandy, there is apple, Greek yogurt, and mincemeat. No, I don’t know why. I’m guessing that the consistency gets all messed up by the mincemeat and the yogurt is needed to offset it. It does result in a somewhat more solid muffin than the common or garden kind*but in a good way. There is some slight resemblance to scones, although they are fluffier than that. They taste like nothing else, but are definitely good fun for a change and the whole sordid mess works out beautifully in the end. * My Granny had a muffin garden and would often have a good crop in August when we visited for the summer holidays. Alas, modernisation and climate change have taken their toll and the muffin gardens and sponge-cake fields of the past are now a lost art and are becoming thing of legend. Recipe: Cakes, bakes, puddings and prayers by Susan Over, page 42.